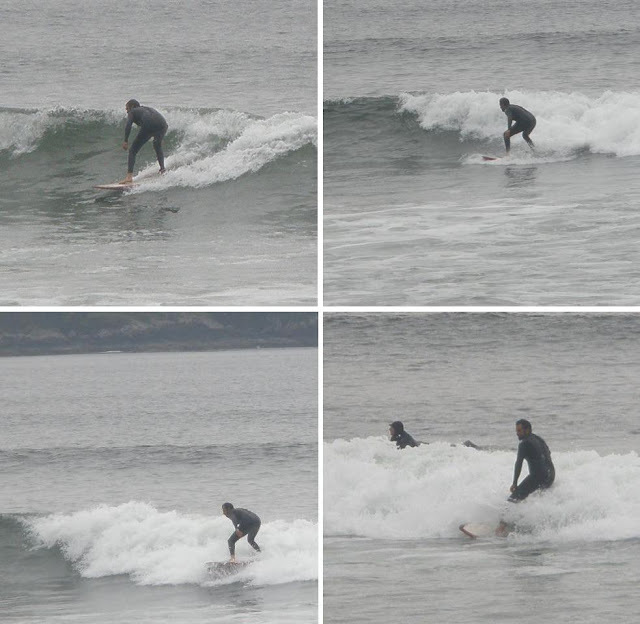 After nearly two months of surfing all the significant breaks, it's safe to say that if you're up to dealing with occasional drizzle, a lot of overcast days, and the usual summer lulls which could last a week, Vancouver Island is thriving with surf. Both Tofino and Ucluelet have more than enough surf shops to help you out, and the surf itself can be amazingly good with sparse crowds. I've compiled a brief description of each break, in the event you decide to visit the area for both its pristine wilderness and great surf. Probably the most beautiful of all the beaches between Tofino and Ucluelet. You won't see Florencia Bay (the locals call it "Flo") listed in most surf travel guides, and if a local didn't tell me about this special spot on my first night in town, it probably would have taken me weeks to find the place. Truth be told, it isn't hard to find. You head north towards Wickaninnish Beach and turn left at the sign that says, "Florencia Bay". Simple as that. Yet, with the exception of an unusually warm summer day where temperatures were in the upper 80's and bomb sets measuring close to 10 feet were pounding the beach, it's relatively empty. On small days a decent set will come through every 5-10 minutes. The beach faces directly south, so when a great south swell comes in, this place goes off the hook. Probably caught the biggest wave of my life here. And the best part? The way it's topographically set up, it blocks out most wind so the water stays calm. One day I surfed Flo for two hours with not another soul in sight. Probably the only time this has ever happened to me. Talk about a peaceful experience. It isn't always going off, but when it does, I highly recommend spending a couple of hours in this little slice of paradise. The best way to describe Wickaninnish Beach is to compare it to Ocean Beach, San Francisco. It can get choppy and windy in a hurry, with heavy fog preventing vision past 15 feet and currents pulling you down the beach in a flash. But when it's small nearly everywhere else, Wick will have something, and most of the time that "something" will be a pretty good ride. I caught a few lefts here that turned out to be some of the rides of my life. "Wick" is extremely popular amongst locals and tourists staying in Ucluelet, since it's only a 15 minute drive away. The convenience factor is a plus, but from my short time here I've found that if it's good at Wick, it's great at Cox Bay. Problem is, Cox Bay is another 20 minutes away from Ukee (Ucluelet). It's a love/hate relationship with the Wick: Some days it's great, others can be flat-out nasty. You'll never get the same day twice at Wick. Near the mid-way point between Ukee and Tofino lies the most well-known break in the area: Long Beach. Parking lots here are packed regularly with tourists and beginners during the summer, but unless it's firing, the break doesn't provide much of a swell during the summer season. When a good swell does come in though, Long Beach can provide some epic rides. There's a rock that splits Long Beach into a north and south side, and this rock sets up one of the few peaks in the area. During a recent strong south swell that hit the Pacific Coast, I managed to grab an incredible left courtesy of said rock. A local surf instructor I hung out with a few times told me that twice he got barreled at Long Beach. Long Beach definitely has some great days. Overall, Cox Bay has the best surf in the area. The way Cox Bay is situated, swells tend to squeeze their way through the bay's entrance, giving it an extra push that you won't find at other local breaks. When it's flat everywhere else, a longboard can provide decent rides at Cox Bay. When it's firing at a place like Wick (both breaks face similar directions), Cox Bay provides nice peaks with the occasional a-frame, providing ample room for surfers to go right or left. You'll find more beginners at Cox Bay than at any other break in the region, mainly due to its reputation and location (it's located 15 minutes from the heart of Tofino). As a result of this, at times some of the beginners become delusional and think they're ready to go past the whitewash and attempt to catch the bigger outside waves. It's wise to be cautious of the beginner herd when they get adventurous, for they can drop-in on you and ding your board (or head). I was lucky to avoid any unpleasantness with beginner kooks, but I could see this being a problem, and it'll become a major dilemma in the near-future, as Vancouver Island continues to explode in popularity. There is a downside to Cox Bay: It can't handle swells that go above 6+ feet. With larger swells, Cox Bay turns into Closeout City. During my time spent on Vancouver Island, I interviewed Canada's top surfer, Pete Devries. During the interview, Devries mentioned that he started learning at Chesterman Beach, located just a few minutes outside of Tofino. This was the only major break I didn't have a chance to surf, and for good reason: A major swell is needed for this place to go off. Every time I would drive to Chesterman, thinking that there was a sufficient swell, all I would see was Lake Pacific. Flat. I'm guessing that Chesterman Beach (which is actually two separate beaches called North Chesterman and South Chesterman) fires during the winter, because I didn't see a thing during the summer months. There are a few other breaks in the region whose knowledge is kept relatively quiet to avoid the word getting out to tourists and potential residents. One of them is north of Tofino and accessible only by boat. There are also a couple of breaks located near Mussel Beach; one of them supposedly reaches near-perfection when most other breaks are too wild and nasty during the winter months. And during a whale watching trip in Barkley Sound, our guide showed us a reef break just outside the Broken Group Islands that he said provides a beautiful right that peels forever. Vancouver Island is a hidden gem with countless options to catch waves. While the winter conditions can be downright nasty, there can be something for everyone if you look hard enough, and none of the ego and congestion that surfers are used to in places like my home state of Cali-For-Nye-A.